Samples range in price from $1.99 to $3.99 and are sent with the colors and wording shown on the item’s product detail page. A sample cannot be personalized with your colors and wording. 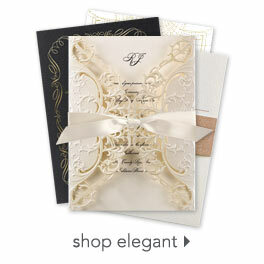 However, you may place an order for the lowest quantity available to see your invitations personalized. In addition, online proofs are available at checkout before your invitation is printed. In addition to the invitation samples you've requested, you'll receive a card with printed examples of our entire ink color palette. Samples are typically shipped USPS first class and are delivered 4–12 days after the order is placed. Want your samples sooner? Upgrade to UPS Ground, UPS 3-Day, UPS 2-Day or UPS Overnight Delivery (shipping upgrades include tracking).